Many people experience extreme anxiety just thinking about dental work and dentist visits. When all you can think about is what could go wrong, it makes it difficult to seek out proper dental care. At Echeverri Dental Center, we have a solution to ease your dental fears. 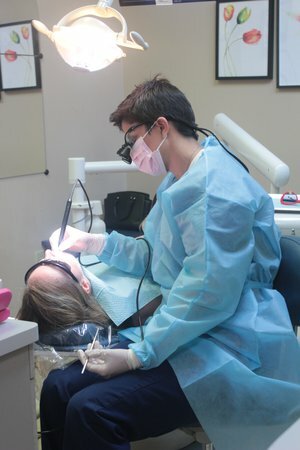 Sedation dentistry can help you relax, so you can receive crucial dental care. Nitrous Oxide: Nitrous oxide is affectionately nicknamed “laughing gas” because it is known to make patients feel happier and even euphoric. Under nitrous oxide, your sense of awareness will be dulled. You’ll be less likely to feel any pain or discomfort during your procedure. While your awareness is somewhat numbed, you’ll still be able to respond to your dentist and answer questions. Oral Sedation: Oral conscious sedation is administered through a pill. Your dentist will instruct you to take the pill a few hours prior to your appointment. The pill should heavily dull your awareness and numb your senses. When taking oral conscious sedation, it is important to arrange a ride to and from the dentist office as it is absolutely unsafe to drive yourself while under the effects of the pill. IM Sedation: IM sedation is short for “intramuscular sedation.” Our experienced team will provide sedation by injecting anesthesia into your muscle. We typically administer IM sedation through the upper arm or thigh muscles. At Echeverri Dental Center, we have a close relationship with an experienced anesthesiologist. When our anesthesiologist is available, we can provide IV sedation. IV sedation is a sedative delivered through an IV. The benefit of IV sedation is that your dentist can easily increase or decrease your sedative intake during your procedure. Under special circumstances, we offer complete sedation. Complete sedation must be done at a hospital and is only available to pediatric patients. Call Echeverri Dental Center to learn more about sedation dentistry. You no longer need to be afraid of going to the dentist with sedation dentistry! Contact us today to schedule an appointment!